The Financial Industry Regulatory Authority (FINRA) has named Timothy C. Scheve as a new Large Firm Governor on its Board of Governors. FINRA's board has 23 members, 10 of whom come from Wall Street. Those industry members include three each from large and small firms, one from a medium-size firm, one floor member, one independent dealer/insurance affiliate and one investment company affiliate. 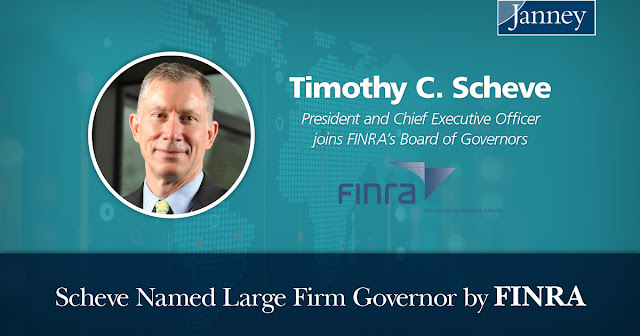 For his part, Scheve said he was excited to serve on the board and support FINRA's regulatory work. "FINRA performs an important role not only in safeguarding the markets but also facilitating a vibrant securities industry," Scheve said in a statement. "FINRA will benefit greatly from Tim's insights regarding the firms and markets we regulate as we advance our mission of investor protection and market integrity," FINRA CEO Robert Cook said in a statement. Read the full press release via FINRA here.